There will be a full family program on Saturday and Sunday for children and parents. 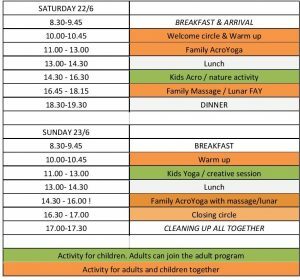 BRING YOUR CHILDREN FOR 2 DAYS OF FUN, PLAYTIME, YOGA, FAMILY ACROYOGA AND MASSAGE. Join the festival with your children. We offer a special program for parents and children. The Family program provides a time and space for kids and their adult friend/parents to play and have fun together. 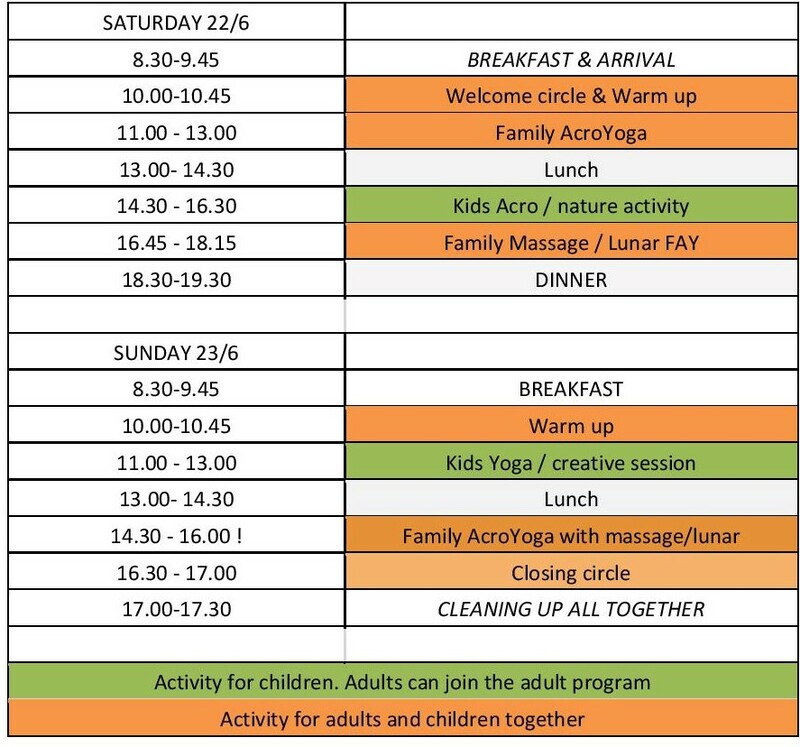 There will be Family AcroYoga, Yoga for kids and Kids Acro Play workshops in parallel with the general program, and other fun activities. The family AcroYoga classes are for adults and children together. During the children classes, the adults are welcome to join a workshop for adults. The parents are responsible for their own children during the festival. The camping for the children will be open Friday evening. You can join both the normal festival program for adults and the family classes with your children. You have to buy an ADULT+FAMILY ticket. Or you can join only the family program with your child. Then you buy a FAMILY ticket. Family AcroYoga is a playful union of partner yoga, acrobatic flying poses and games. Family AcroYoga is a great way for kids to increase understanding of themselves, others, and the world, while having fun! Family AcroYoga provides a time and space for kids and their adult friend/parents to play and have fun together. Family AcroYoga also includes the healing arts and massage. You can read more about Family AcroYoga here.